This article was written By Colleen Wanglund on 31 Jul 2012, and is filed under Reviews. Written and directed by Yeun Sang-ho, The King of Pigs looks like just another movie cautioning against childhood bullying, but the story goes far deeper. The animated film opens with a woman who has been stabbed to death and the husband who is probably responsible for it and is also experiencing some weird hallucinations. The man, Hwang Kyung-min (voiced by Oh Jung-se) then calls his old friend from middle school, Jung Jong-suk (voiced by Yang Ik-june) who is currently working as a ghost writer, but he wants to someday write his own novel. The two men meet for the first time in fifteen years and after some brief chit chat they begin discussing their school years. Jong-suk was from a poor family and Kyung-min was a small, shy boy so their social standing in school was very low. They were mercilessly bullied and called pigs by the ruling class—bigger, older boys called dogs. 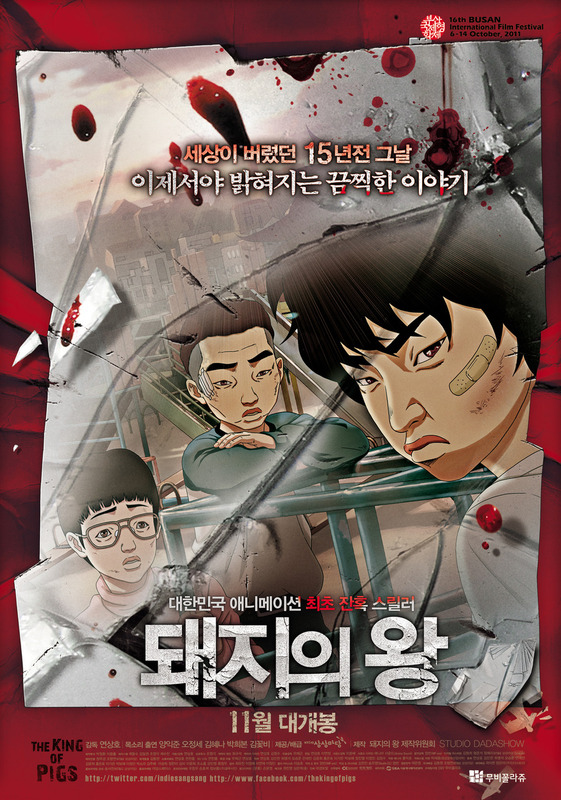 One day in class a quiet boy, Kim Chul-yi (voiced by Kim Hye-na) becomes angry when the two boys are viciously tormented and attacks the bully, sending him away covered in blood. The three become friends and form a sort-of cult of victimization. Chul-yi, however has some deep psychological issues, telling the two boys that they “must become monsters if they don’t want to live like losers”. Chul-yi stabs a cat to death and demands that Jong-suk and Kyung-min do the same. As the two men continue reminiscing they walk over to the school they used to attend and it is here that Kyung-min tells Jong-suk that he knows the truth about what really happened one awful assembly day out in the school yard. The King of Pigs is essentially a violent indictment of a patriarchal society that rewards and punishes based on economic class or perceived weakness and the low-budget animation style suits the film’s grim storyline. The voice acting is excellent, with the actors reflecting the humiliating circumstances of the characters, both as children and as adults. The use of the word “pig” to describe the children lowest on the school ladder brought to mind Piggy from William Golding’s Lord of the Flies, a character who was brutally murdered for his weakness among his classmates. The scenes of bullying can get a bit repetitive, but the movie’s grittiness and pacing increases the rising tension between the characters in both the scenes of childhood and adult torment. The mood is dark and somber, accentuating the characters’ misery. Overall The King of Pigs is a very good movie with a shocking and unpredictable ending. It played during this year’s New York Asian Film Festival at the Walter Reade Theater.